Kealii Krzyska, his wife Carryssa, Kalani Ellis and his girlfriend Kelly and Kealii's uncle Lance Kalamau were on a holoholo trip to Ka'ena Point on O'ahu when Kealii made his big catch. The bruddahs caught bait then swam their lines out through stormy seas complete with lightning. In short order, Lance hooked a 26-lb ulua and as they were battling it, Kealii's pole hooked up to a massive 109.1-pounder. Kealii battled the monster for 30 minutes using his 13-foot Nitro pole, extended 4/0 Daiwa reel and 80-lb Hi Catch line. 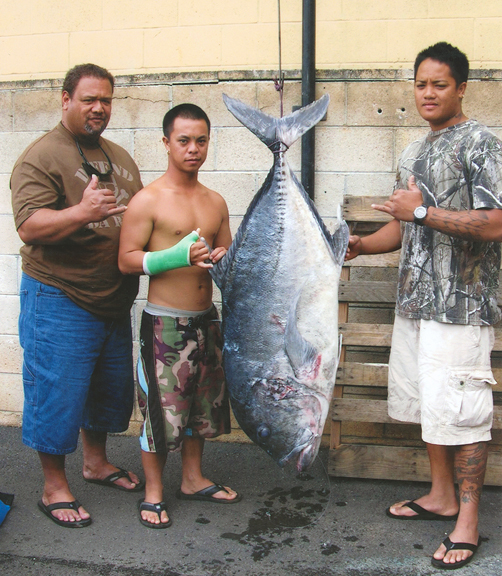 Before the night was over, Kalani added a 36-lb ulua to the fishbag, too.